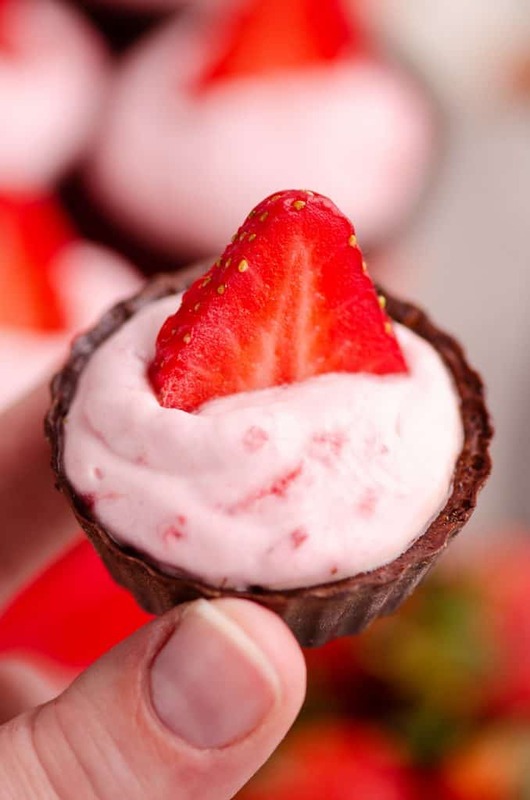 Strawberry Dark Chocolate Mini Dessert Cups are a quick and easy 10 minute recipe with 4 simple ingredients and only 125 calories for a light treat. They are a finger food perfect for your next party’s dessert table. My former boss used to cringe at the mention of Cool Whip and frankly I always thought she was being a food snob about it. That was until I made homemade whipped cream for myself. Not only was it easy, it tasted a million times better than any of the hydrogenated oil crap we buy in the freezer. Turns out she wasn’t a food snob, she just knew good food! Don’t get me wrong, Cool Whip still has it’s place for certain desserts like this Light Berry Angel Food Cake. Sometimes you just need something that is super fast and is more stable for refrigeration. 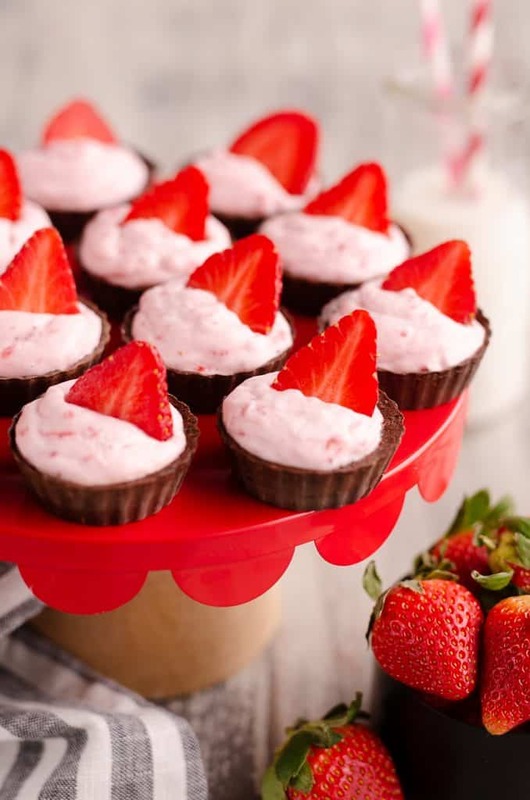 Real whipped cream is where it is at though when it comes to showcasing simple sweet flavors in recipes like these Strawberry Dark Chocolate Mini Dessert Cups. This recipe is so simple and really highlights the great flavor of sweet strawberries. Not only does it taste great, it is a special treat you can whip up last minute for your sweetheart this Valentine’s Day! They are a great little individually portioned single-serve food so you can enjoy just one low-calorie dessert for the special occasion or go to town and gobble up a few more if you are throwing caution to the wind for the holiday. 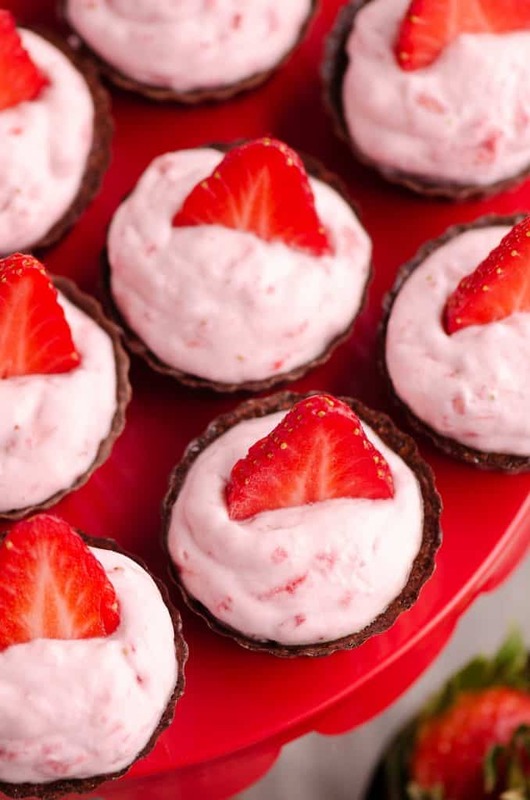 To make this easy no-bake dessert, grab a medium bowl and toss in the sugar and chopped strawberries. Using a potato masher or fork, mash the strawberries. Strawberries are hit or miss in the winter. Our local grocery store has actually had some pretty great berries in lately so I was able to use fresh fruit. If they aren’t so stellar, you could use frozen unsweetened strawberries for the whipped cream. Add in the heavy whipping cream with the fruit and grab your beaters…unless you have arms of steal and want to whip the cream by hand. In that case, I bow down to your strength and determination! Whip up the cream and strawberry mixture for a couple minutes until it forms soft peaks. At this point, try your hardest to avoid stealing all the light strawberry goodness from the bowl and save it for the chocolate cups! Add the strawberry whipped cream to a large resealable bag and snip a small 1/4 inch corner off the bottom of the bag. 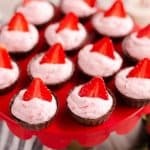 Pipe the whipped cream into the dark chocolate cups and top each one with a slice of strawberry. If you aren’t using fresh fruit for this recipe, top each one with some shaved chocolate or those cute little dark and white chocolate cigarette sticks. Store refrigerated up to 48 hours. You could get all fancy and ambitious like that time I made beautifully marbled homemade chocolate bowls and make your own chocolate cups by pouring melted chocolate into mini silicone muffin cups. If you are like me, who now has children and far less time to spend on frivolous projects like that, you can keep it quick and simple and grab a pack of pre-made chocolate cups from the store. I picked up these CocoMaker Dessert Cups at the grocery store in the produce section. Then again, if you were really like me, you would just enjoy the big bowl of strawberry whipped cream with a spoon. 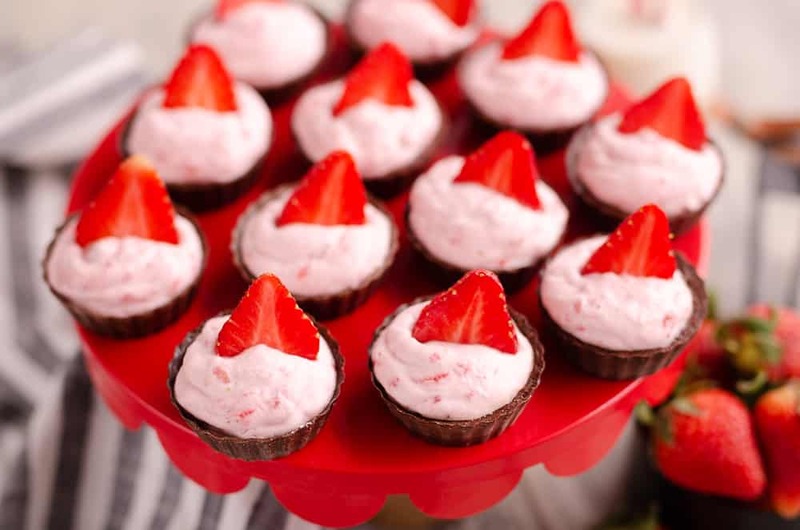 😉 If you are making them for someone special for Valentine’s Day or are planning our your dessert table at your next party, you might want to actually present them in the chocolate dessert cups though. 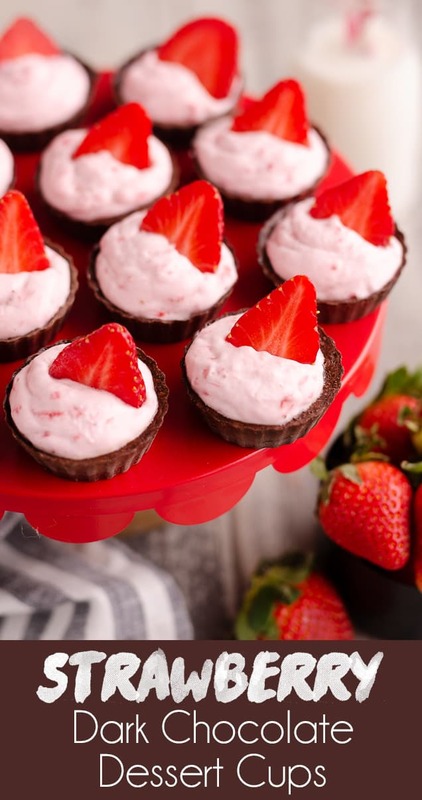 Strawberry Dark Chocolate Mini Dessert Cups are a quick and easy no-bake 10 minute recipe with 4 simple ingredients and only 125 calories for a light treat. Add the chopped strawberries and sugar to a medium bowl and mash strawberries. Add the cream and using a hand mixer, beat until soft peaks form. Spoon the whipped cream into a large resealable bag and snip a small 1/4 inch piece from the bottom corner of the bag. Pipe the cream into your chocolate cups. Top each cup with a slice of strawberry. Store refrigerated up to 48 hours. Serve chilled. 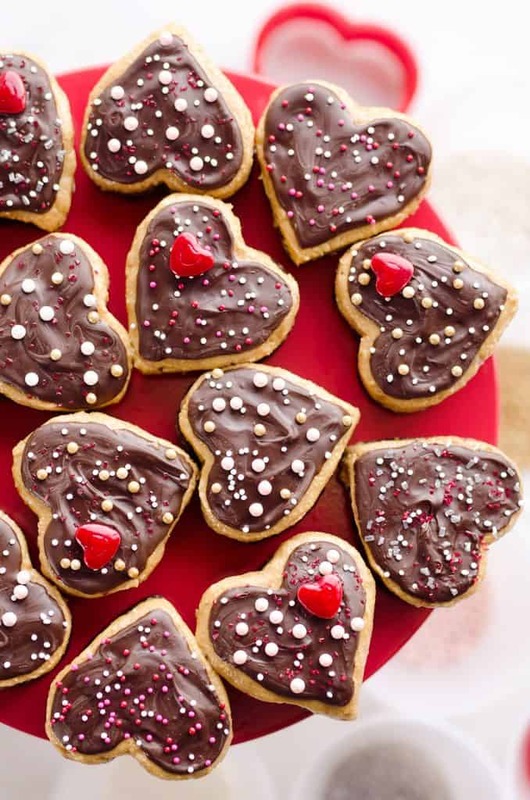 More fancy Valentine’s Dessert Recipes to impress! I didn’t even know you could buy chocolate cups at the store! 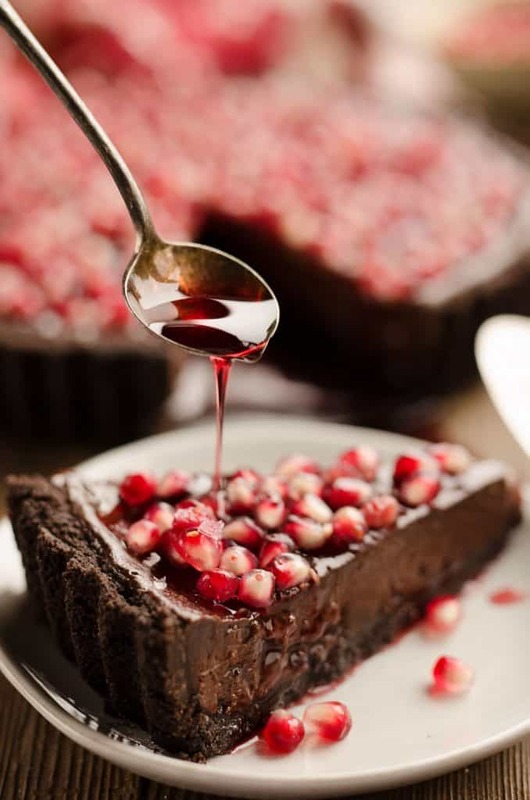 This dessert looks so easy, yet impressive! I would probably scarf down ten in a row! They are so adorable! And they look so easy to make! Love desserts that look like they took time but they really didn’t! Also love the flavor combo! I’m such a huge fan of chocolate + strawberry! These did not disappoint! One of life’s best flavor combinations! 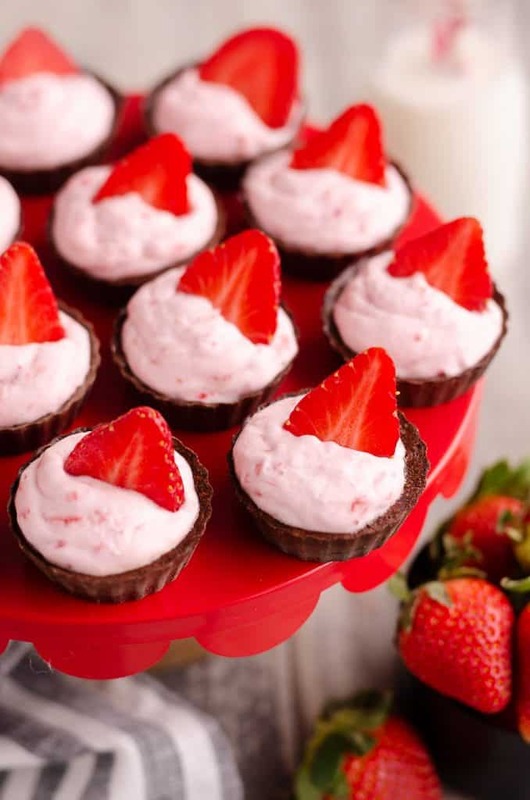 You can never go wrong with strawberries and dark chocolate! One of my favorite combos!! So perfect for Valentine’s Day or even a shower!